to access justice & legal knowledge. The Law Foundation of PEI works to promote the advancement of legal knowledge and access to justice for all Prince Edward Islanders. We do this by funding projects and encouraging partnerships that advance the Foundation’s mandate. Our work is made possible through a fund that we maintain that comes from the interest which banks, credit unions, trust companies, and treasury branches must pay on clients' funds held in lawyers' pooled trust accounts. For more information on how this works, please visit our FAQ page. Aiding in the establishing, operating and maintaining of law libraries in Prince Edward Island. We are proud to serve our Island community! Promote the advancement of legal knowledge & access to justice for all Prince Edward Islanders through funding & partnerships. 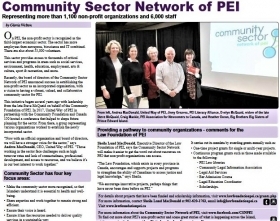 The Employment Journey published an article in its April issue on a community sector network, which includes perspectives from the Law Foundation. The article can be found here. 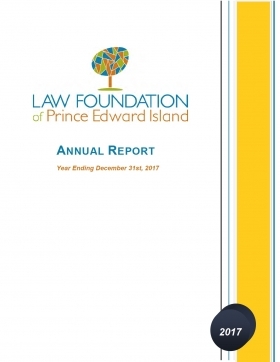 The Law Foundation of Prince Edward Island has announced its grant funding allocation for 2019. Among the recipients are PEI Citizen Advocacy and the PEI Human Rights Commission. The grant to PEI Citizen Advocacy is for the development of a research framework to better understand the access to justice issues facing vulnerable Islanders, specifically those with intellectual disabilities. 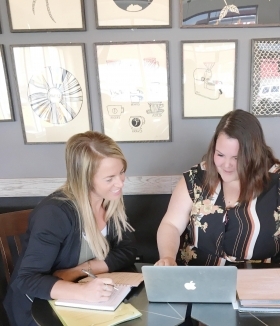 The PEI Human Rights Commission received funding to support a mentorship initiative and for captioning of presentations to be held at a national conference they are hosting in June. In addition, the Law Foundation allocated nearly $170,000 in 2019 to support PEI’s provincial law library services, legal information resources, the PEI bar admission course and various legal education scholarships. Since 2013, the Law Foundation has provided close to $2 million in funding. 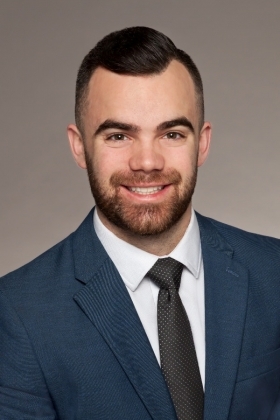 Congratulations are extended to Graeme Stetson who has been named recipient of the Law Foundation of PEI Centennial Scholarship from the Schulich School of Law at Dalhousie University. The Ontario Law Foundation’s Access to Justice Fund (ATJF) is a unique and permanent fund that provides grants to nonprofit organizations across Canada, including Prince Edward Island. They have funded a number of PEI-based initiatives over recent years. Learn more about the Access to Justice Fund fund here. 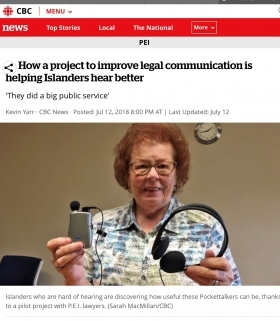 The CBC recently did a story on the availability of pocket talkers at PEI Victim Services. The story can be accessed by clicking here. 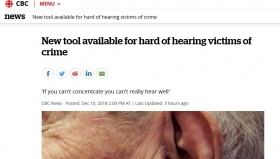 The story notes that: "The introduction of pocket talkers at Victim Services is part of a wider initiative spearheaded by the [Hard of Hearing] association over the last two years in partnership with the Law Foundation of P.E.I., which also funded the project." Real time captioning will make Human Rights Day Accessible to the Deaf and Hard of Hearing. 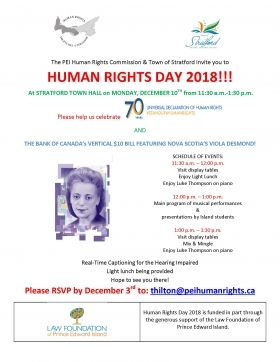 The PEI Human Rights Commission and Town of Stratford invite members of the public to attend Human Rights Day 2018 at Stratford Town Hall between 11:30 and 1:30 on Monday December 10, 2018. For the second year, we are pleased to be able to provide real time captioning to make this event accessible to the hard of hearing. Monique LeBlanc, a representative from the Bank of Canada, will join students from the Stratford Elementary Honor Choir, École François Buote, Queen Charlotte Intermediate and Charlottetown Rural High School to celebrate the 70th anniversary of the signing of the Universal Declaration of Human Rights and the release of the new $10 bill featuring Canadian human rights icon, Viola Desmond. Viola Desmond was a successful black businesswoman from Halifax who in 1946 challenged racial segregation at the Roseland Theater in New Glasgow, Nova Scotia. Music, art and presentations by local youth will address these and other significant moments in Canadian human rights history. Display tables and a light lunch will be available at 11:30 with the main program beginning at 12. We also wish to acknowledge that this PEI Human Rights Day event was funded in part through the generous support of the Law Foundation of Prince Edward Island. Added November 2018 - The Law Foundation of PEI recently supported a workshop on legal rights for those living with arthritis as part of a forum organized by the PEI Arthritis Society. 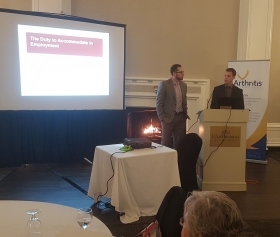 Pictured: Sean Corcoran and Ryan McCarville from the law firm of McInnes Cooper presented on legal rights of those living with arthritis as they relate to employment. 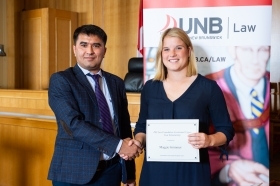 Added October 2018 - The Law Foundation of PEI Centennial Upper Year Scholarship was presented to third-year UNB law student Margaret Grimmer at the October 2018 Law Academic Awards Night ceremony. The presentation was made by Law Professor Vokhid Urinov. 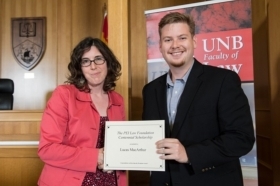 Pictured: Professor Vokhid Urinov (left) presents the Law Foundation Scholarship to Margaret Grimmer. 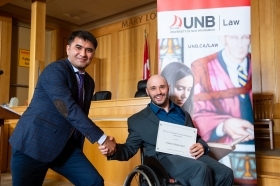 Added October 2018 - The Law Foundation of PEI Centennial Entrance Scholarship was presented to first-year UNB law student Jeremy MacDonald at the October 2018 Law Academic Awards Night ceremony. The presentation was made by Law Professor Vokhid Urinov. 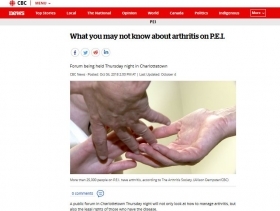 Added October 2018 - The Law Foundation contributed funding to a forum put on by the PEI Arthritis Society. A link to a CBC story leading up to the forum can be found here. The Law Foundation Legal Administration Program awards were presented at the July 27th Holland College graduation ceremony. The two recipents for 2018 were Susan Lott and Mbahenen “Stephanie” Ashaolu. Photo provided by Holland College: Keynote speaker, Cindy Cameron (centre), presents the Law Foundation award to Susan Lott (left) and Stephanie Ashaolu (right). Always wonderful to see an organization we fund benefit from a project that we also fund! 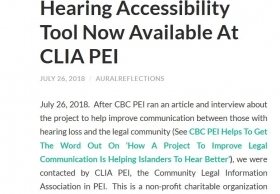 Go to the PEI Chapter of the Canadian Hard of Hearing Association blog here to read about how CLIA clients can now access hearing assistive devices. The deadline for funding applications is September 10th, 2018 for projects set to begin in 2019. Click on the "How to Apply" tab located on the top of this page to access application materials. 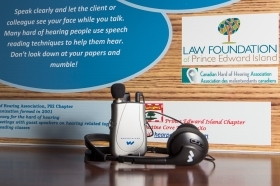 The PEI chapter of the Canadian Hard of Hearing Association recently discussed the progress of their project funded through the Law Foundation of PEI. Access the CBC radio interview here and the written article by CBC's Kevin Yarr here. 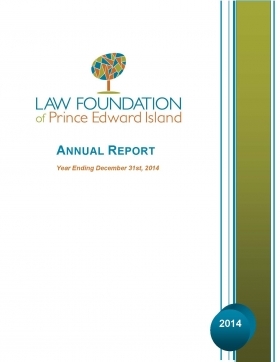 Click here to read the 2017 Annual Report of the Law Foundation of Prince Edward Island. The Law Foundation of Prince Edward Island has announced its grant funding for 2018. Among the recipients are the PEI Hard of Hearing Association and the Cooper Institute. The Foundation also granted over $165,000 this year to support PEI’s provincial law library services and legal information resources, the Community Legal Information Association, the bar admissions program and legal education scholarships. Projects completed in 2017 included a parenting coordination and family arbitration pilot project and the development of a family violence prevention education video geared to newcomers. The Foundation encourages innovative ideas that advance legal knowledge and promote access to justice on Prince Edward Island. “We are happy to discuss our funding program and encourage interested organizations to visit out webpage and contact us with any questions.” Scales said. For more information on the work of the Law Foundation of PEI, visit their website at www.lawfoundationpei.ca, or contact Sheila Lund MacDonald, Executive Director. 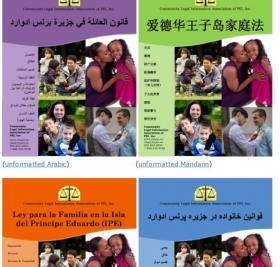 These booklets are designed to improve access to family law information for people who are new to Canada. We could not have completed this work without the support of many Newcomer volunteers, who helped us with translation, editing and reviews. Thank you! We are also grateful for financial support from the Interministerial Women's Secretariat and the Law Foundation of PEI. 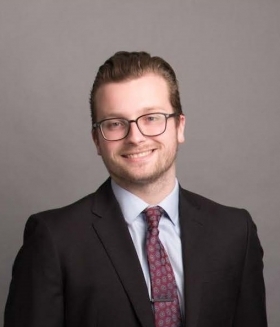 Congratulations are once again extended to Parker Baglole who has been named the recipient of the Law Foundation of PEI Centennial Scholarship from the Schulich School of Law at Dalhousie University. This is the second year in a row that Mr. Baglole has earned this scholarship. 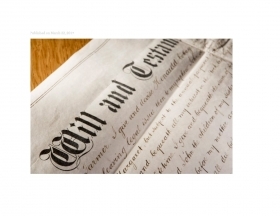 The Canadian Bar Association (CBA) Young Lawyers' Section and the Wills and Estates Section have announced they are offering a 2018 Wills Clinic. The project is being coordinated through PEI's Community Legal Information Association. Follow this link for a CBC story by Katerina Georgievaon on the continuation of a free legal advice project. La Forest here. Professor La Forest discussed the evolution of Canadian and International Human Rights Law. Photo: Professor La Forest (left) at post-lecture reception. 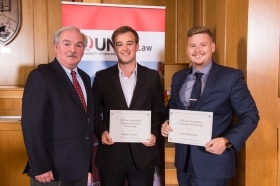 Law Foundation of PEI Centennial Scholarships were presented to UNB students Zachary Tweel (Entrance scholarship) and Lucas MacArthur (Upper Year scholarship) at the October 2017 Law Academic Awards Night ceremony. Presentations were made by Law Professor John McEvoy . Join us at the Guild on October 20th for the 2017 Thane Campbell Lecture. 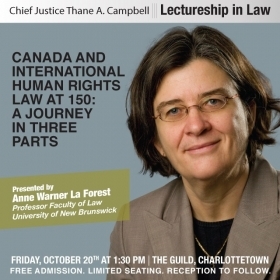 This year's speaker is Professor Anne Warner La Forest who will be discussing Canada and International Human Rights Law. CBC PEI's Island Morning recently covered a video project for newcomers that was funded through the Law Foundation of PEI. The story can be accessed at the CBC website here. 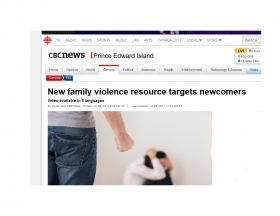 There is also an audio link to an interview between Island Morning's Matt Rainie and PEI Family Violence Prevention Services Executive Director, Danya O'Malley. The interview can be accessed here. 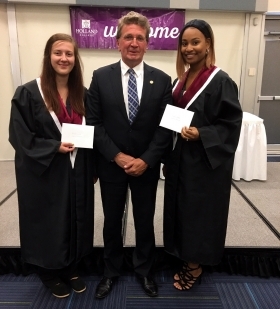 Law Foundation board member John Maynard (Key Murray Law) presented Haley Stavert (left) and Shanae Deveaux (right) with Law Foundation Legal Administration Program Scholarships at the Holland College graduation ceremony held on July 28th. 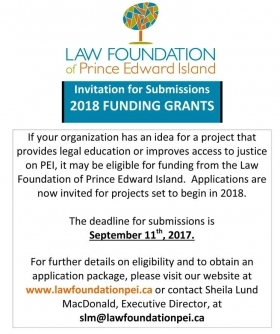 If your organization has an idea for a project that provides legal education or improves access to justice on PEI, it may be eligible for funding from the Law Foundation of Prince Edward Island. Gary Scales, Chair of the Law Foundation, recently announced that applications are being accepted for projects set to begin in 2018. Scales encourages interested organizations to visit the Foundation’s website to better understand the types of ideas that might be eligible. “For example, in 2017 the Foundation funded a video project about legal services for newcomers, and another project involving the purchase of equipment to assist legal clients who are hard of hearing.” Scales explains. 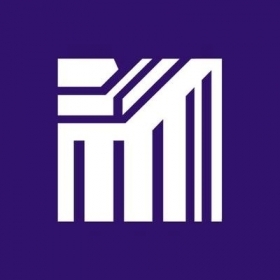 The Foundation also provides annual funding to support community legal education programs, law scholarships, bar admissions education and law library services within the province. The deadline for all applications is Monday, September 11th, 2017. 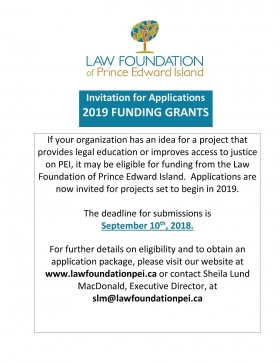 For further details on projects that are eligible and to obtain an application package, please visit the Foundation’s website at www.lawfoundationpei.ca or contact the Executive Director, Sheila Lund MacDonald at slm@lawfoundationpei.ca. 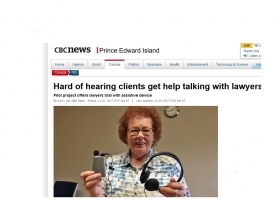 CBC PEI's Island Morning covered project to assist legal clients who are hard of hearing that was funded through the Law Foundation of PEI. The story can be accessed at the CBC website here. There is also an audio link to an interview between Island Morning's Mitch Cormier and PEI Chapter of the Canadian Hard of Hearning Association's Annie Lee MacDonald and Daria Valkenburg. The audio interview can be accessed here. The Law Foundation of Ontario recently issued a nation-wide call for funding proposals. The funding details are located here. 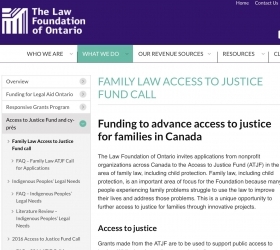 The Law Foundation of Ontario invites applications from nonprofit organizations across Canada to the Access to Justice Fund (ATJF) in the area of family law, including child protection. Family law, including child protection, is an important area of focus for the Foundation because many people experiencing family problems struggle to use the law to improve their lives and address those problems. This is a unique opportunity to further access to justice for families through innovative projects. Congratulations are extended to Parker Baglole who is the 2016/17 Law Foundation of PEI Centennial Scholarship recipient from the Schulich School of Law at Dalhousie University . Click here for a Guardian story on law clinics being held for low income Islanders. The Law Foundation of Prince Edward Island recently announced its funding recipients for 2017. They include PEI Family Violence Prevention Services, the PEI Chapter of the Canadian Hard of Hearing Association and the PEI Parenting Coordination Society. The Foundation supports initiatives that advance legal knowledge and promote access to justice on Prince Edward Island. “This year’s projects focus on parenting coordination and family arbitration, supporting the hard of hearing, and family violence prevention education for newcomers,” says Gary Scales, Chair of the Foundation. In addition to its 2017 grants, the Foundation contributed over $190,000 in support of PEI’s provincial law library service and legal information resources, the Community Legal Information Association, the bar admissions program and legal education scholarships. 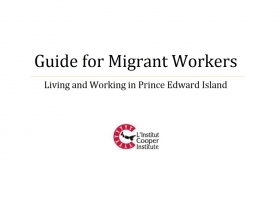 A new guide for migrant workers living and working in PEI has been produced by Cooper Institute, with the research funded through the Law Foundation of PEI. 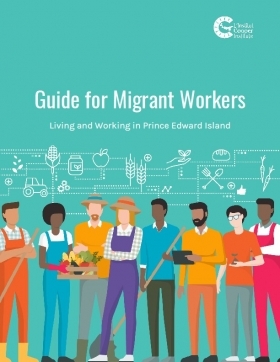 This guide serves as a plain-language introduction to the laws and policies affecting migrant workers in PEI. You can link to the document here. 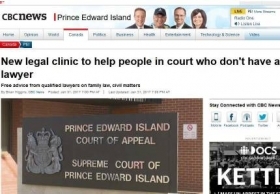 Click on this link to read a CBC PEI story by Brian Higgins on a new Island legal clinic. 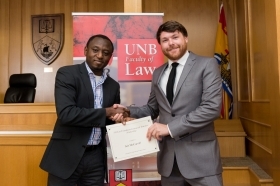 The UNB Faculty of Law recently awarded scholarships to students from Prince Edward Island. The PEI Law Foundation Entrance Scholarship was given to Lucas MacArthur, a first year student from Charlottetown; and the PEI Law Foundation Upper Year Scholarship was awarded to Jennifer Singh, a third year student also from Charlottetown. 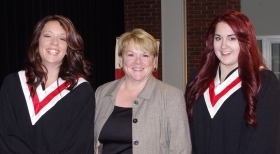 The presentations were made at the UNB Academic Awards Night Ceremony held in October. The Law Foundation of Prince Edward Island contributes funding to scholarships and projects that promote the advancement of legal knowledge and access to justice for all Prince Edward Islanders. 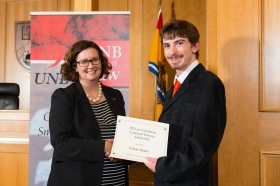 UNB Professor Hilary Young (left) presents the PEI Law Foundation Entrance award to Lucas MacArthur of Charlottetown. 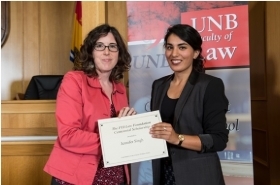 UNB Professor Hilary Young (left) presents the Upper Year Centennial Scholarship to Jennifer Singh of Charlottetown. 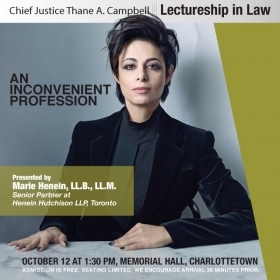 Marie Henein will give a lecture titled “An Inconvenient Profession” at the 2016 Chief Justice Thane A. Campbell Lectureship in Law on Wednesday, October 12, at 1:30 p.m., in Memorial Hall, Confederation Centre of the Arts. Henein will focus on the role of the legal profession in society, including both the personal demands of the profession as well as the commitment required to the legal system and the rule of law in firmly protecting the role of independent counsel. 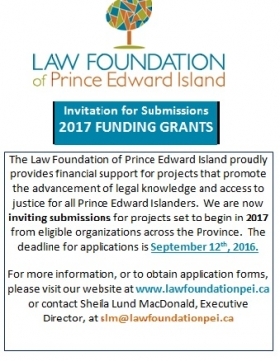 The Law Foundation of Prince Edward Island is now accepting funding applications for projects set to begin in 2017. The deadline for all submissions is September 12th, 2016. In 2016, the Foundation provided funding for education and research related to child custody issues, family violence prevention, foreign migrant workers, and parenting coordination. Core funding is provided to support community legal education programs, law scholarships, bar admissions education and law library services. The mandate of the Foundation is to promote the advancement of legal knowledge and access to justice for all Prince Edward Islanders by providing funding support and encouraging partnerships. Pictured in Photo: John Maynard (Key Murray Law) awarded Virginia Harris one of two available Law Foundation Legal Administration Program Scholarships at the Holland College graduation ceremony held on July 28th. Missing from the photo is Harminder Kaur, the second scholarship recipient. 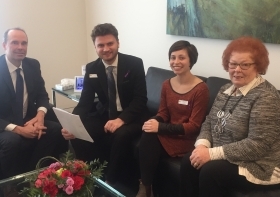 The Law Foundation of Prince Edward Island recently announced its 2016 grant recipients. The Foundation offers funding support to projects that advance legal knowledge and promote access to justice for all Islanders. Recipients include Family Violence Prevention Services, Alzheimer Society of PEI, the Cooper Institute and the Community Legal Information Association. The Foundation also approved funding for the second phase of a Parent Coordination Service being developed through the Family Law Section of the PEI Department of Justice. Collaborations among organizations with different areas of expertise and from different areas of the country are encouraged. The Public Legal Education (PLE) Learning Exchange supports organizations across Ontario in developing and delivering effective public legal education and information (PLE) for their communities. With help from Ryerson Law Research Centre, Community Legal Education Ontario (CLEO) has put together an annotated bibliography of research on public legal education and information (provincial, national and international in scope). This is a work in progress and they continue to add research reports on an ongoing basis. You may link to the database here. Iain McCarvill (right) received the PEI Law Foundation Centennial Entrance Scholarship at the University of New Brunswick's October 15th Academic Awards Night ceremony. Professor Olasisi Akinkugbe (left) presented this award to Mr. McCarvill. 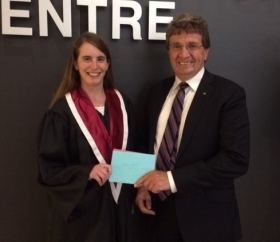 The 2015 UNB Upper Year Centennial Scholarship recipient is Amanda Blakeney. Paul Kiley, Chair of the Law Foundation of PEI, is pleased to announce that Barbara E. Smith, Q.C. has been appointed to serve on the Foundation’s Board of Governors. Ms. Smith joined the Charlottetown Office of Stewart McKelvey (then Scales Jenkins McQuaid) as a clerk in March of 1990 and returned to the firm after graduating from Dalhousie Law School in June of 1991 to complete her articles. She was called to the PEI Bar in April of 1992, became a partner with the firm in 1997 and received her Queens Counsel designation in January of 2008. Barb is an active volunteer in her community. Some of her previous involvements include serving as a board member and chair of the Queen Elizabeth Hospital Foundation Inc., and as a member of the Advocacy Committee of the Canadian Cancer Society, PEI Division where, as a result of this involvement, she was the recipient of the Queens Jubilee Award in 2002. This year's Thane Campbell Lecture will be held Oct 2 (Friday) at 1:30 (reception to follow) at The Guild at 115 Richmond Street (across from Confederation Center). 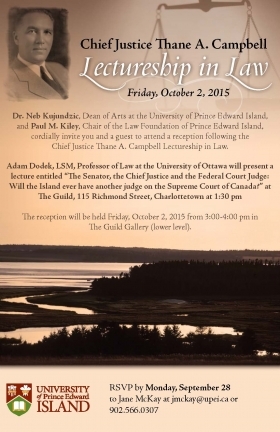 The speaker is Adam Dodek, University of Ottawa. This lecture will discuss the politics of appointments to the Supreme Court of Canada and the interaction between regionalism and other factors. How does the Duffy scandal and the failed appointment of Justice Marc Nadon impact appointments to the Supreme Court? Will these help or hinder the Island’s chances of ever having another judge appointed to the Supreme Court? 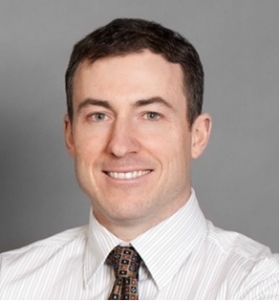 Professor Adam Dodek, LSM, teaches Public Law, Constitutional Law, Legal Ethics and a seminar on the Supreme Court of Canada at the University of Ottawa’s Faculty of Law. He grew up in Vancouver and earned degrees from McGill, Harvard Law School and the University of Toronto. He clerked for the Supreme Courts of Canada and Israel, as well as the U.S. Court of Appeals. He has written about the Supreme Court of Canada, the Senate, the Governor General, judicial independence, judicial ethics, legal ethics and the regulation of the legal profession for academic publications and for the popular press. He is the author of The Canadian Constitution (Dundurn) and Solicitor-Client Privilege (Lexis Nexis). In 2014, Canadian Lawyer named Dodek as one of the Top 25 most influential lawyers in Canada and in 2015, the Law Society of Upper Canada awarded him its highest honour, the Law Society Medal. The Law Foundation of Ontario has a new funding opportunity through its national Access to Justice Fund (ATJF). They are now accepting applications from across Canada in the area of investor rights. Many ordinary Canadians invest in the market to provide needed income, but they may lack financial literacy or expertise and require information and protection when navigating the often complex investment landscape. Without adequate information and protection, the rights of retail investors, especially the most vulnerable, may be compromised. FOR MORE INFORMATION visit ATJF Investor Rights Call for Applications. 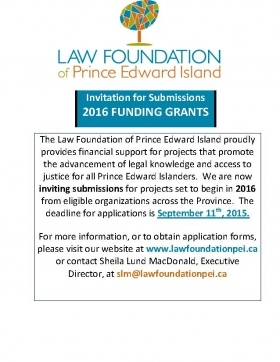 The Law Foundation of PEI invites your organization's funding application for projects set to begin in 2016. Applications can be up to $15,000 in value. For more information click here. 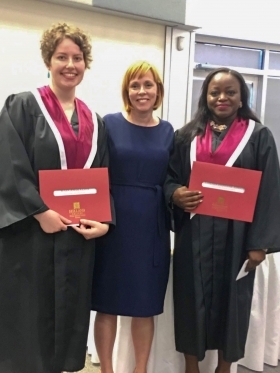 Sheila Lund MacDonald (left), Executive Director of the Law Foundation of PEI, recently awarded Alanna Gallant (centre) and Santana Muttart (right) the Law Foundation's Legal Administration Program Scholarships as part of the Holland College graduation ceremony held on July 24th. 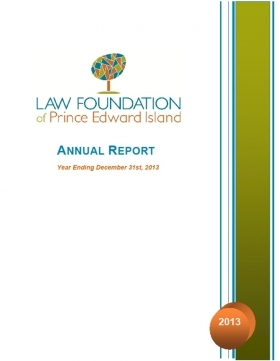 The Law Foundation of Prince Edward Island contributes to projects that promote the advancement of legal knowledge and access to justice for all Prince Edward Islanders by providing funding support and encouraging partnerships. PLEASE NOTE THAT THIS YEAR'S INTAKE OF PROPOSALS DOES NOT INCLUDE A LETTER OF INTENT PHASE. ALL APPLICANTS ARE REQUIRED TO SUBMIT A FULL PROPOSAL BY THE SEPTEMBER 11TH DEADLINE. The University of New Brunswick awarded the entrance scholarship to Joshua Adams from Kensington, PE, and the upper year scholarship to Alexandra Dalton, a third-year student from O’Leary, PE. The Law Foundation of PEI provides financial support for these scholarships. 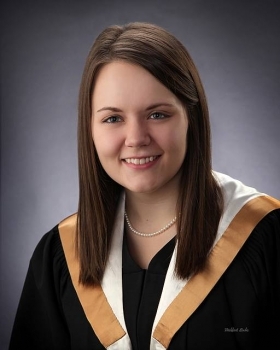 Congratulations to Lindsay Silliker of Charlottetown who is the 2014/15 Law Foundation of PEI Centennial Scholarship recipient from the Schulich School of Law at Dalhousie University . 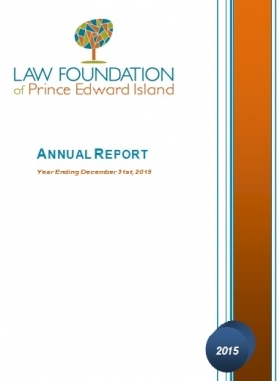 The Law Foundation of Prince Edward Island recently announced its annual grant recipients for 2015. The Foundation supports projects that advance legal knowledge and promote access to justice for all Islanders. “We are very happy to provide grants for activities that benefit Islanders from many walks of life,” said Foundation Chair, Paul Kiley. He noted that in its funding decisions, the Foundation particularly considers collaborative and innovative approaches for providing legal aid and legal education to the public. The PEI Human Rights Commission – For the continuation of its program to integrate human rights education into the K-12 system across PEI. Community Legal Information Association (CLIA) – An annual operational funding grant and funding to support students involved in the project: “Answering the Call for Legal Information – The Next Generation”. PEI Family Law Services – In support of a Parent Coordination Program Pilot Project. In addition to these grants, the Foundation continues to provide over $300,000 in annual grant support to PEI’s provincial law libraries, legal education services, family legal aid, the PEI bar admissions program, and legal education scholarships. Where do the funds go? Click on the link for an overview. Grant Agreements were recently signed for 2015 projects, including a Parent Coordination Program Pilot Project under the direction of the PEI Family Law Section. Pictured from left to right are: Loretta Coady MacAulay, Q.C., Manager, Family Law Section, Department of Environment, Labour and Justice; Barrie Grandy, Q.C., Director, Legal and Court Services, Department of Environment, Labour and Justice; and Paul Kiley, Chair of the Law Foundation. 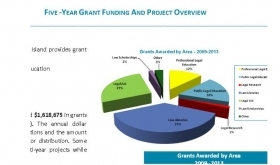 What are Canadian Law Foundations' primary funding source? See this link for an overview of interest earned on lawyers' trust accounts. Presented by the ABA Commission on IOLTA and The National Association of IOLTA Programs, with generous support from The Florida Bar Foundation, The Law Foundation of British Columbia, and The Alberta Law Foundation. Sheila Lund MacDonald, Executive Director of the Law Foundation of PEI, presented the Eastern College Legal Administration Program awards for excellence at a cermony held on November 14th. Congratulations to the deserving recipients, Hannah Bell and Nadine MacDonald. Left Hannah Bell, Sheila Lund MacDonald, and Nadine MacDonald on right. 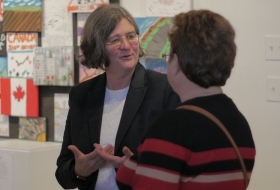 The 2014 Thane Campbell lecture was delivered by Mary Anne Waldron, Q.C., Professor of Law at the University of Victoria and Associate Vice-President Faculty Relations and Academic Administration. 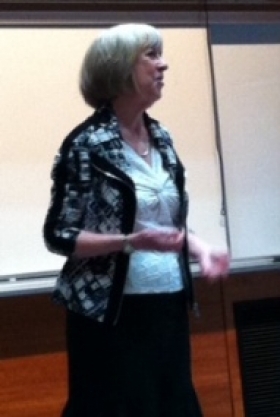 She discussed her book Free to Believe: Rethinking Freedom of Conscience and Religion in Canada. The lecture explored the topic of equality and conscience and was delivered in front of an audience representing education, legal, and community organizations. Law Foundation Board member, John Maynard (Key Murray Law), presented the Holland College Legal Administration Program scholarships at an awards cermony held on July 25th. Congratulations to the 2014 winners, Paige MacPherson (left) and Andrea Matters (right). The Law Foundation of PEI works to promote the advancement of legal knowledge and access to justice on PEI. Since 2007, the Foundation has designated over $2.2 million dollars to fund projects and services that fall within its mandate. 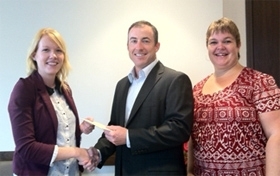 The Law Foundation of Prince Edward Island recently announced its annual grant recipients for 2014. The Foundation supports projects that advance legal knowledge and promote access to justice for all Islanders. “We’re very pleased at the level of interest this year and the diversity of submissions.” said Foundation Chair, Paul Kiley. He noted that the nature of the proposals ranged from conducting legal workshops, to the development of legal educational materials specific to PEI. Recipients for 2014 include the PEI Association for Community Living, Family Violence Prevention Services, and the PEI Human Rights Commission. The Foundation also approved an increase to the annual funding it provides to the Community Legal Information Association in support of its ongoing operations. In addition to these grants, the Foundation continues to provide annual grant support to PEI’s provincial law libraries, family legal aid, bar admissions courses and legal education scholarships. Since 2007, the Foundation has designated over $2 million dollars to fund projects and services that fall within its mandate. 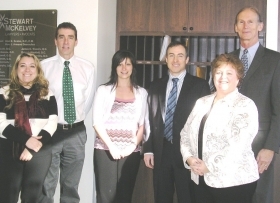 Photo: Left to right: Lindsay Merrill, PEI Family Violence Prevention Services; Tom Hilton, PEI Human Rights Commission; Marlene Foote, PEI Association for Community Living; Paul Kiley (Stewart McKelvey), Chair of Law Foundation of PEI; Brenda Picard, PEI Human Rights Commission; and David Daughton, Community Legal Information Association. Missing from photo are Board of Governors members: Patsy MacLean (HRA), John Maynard (Key Murray Law), Gary Scales (McInnes Cooper) and Barrie Grandy (Attorney General Representative). The University of New Brunswick’s Entrance and Upper Year Prince Edward Island Law Foundation Centennial scholarships were awarded for the 2013 academic year. The entrance scholarship was awarded to Chenchen Yu from Stratford, PE. Donald Cameron, a third year student from Bonshaw, PE received the upper year scholarship. Ms. Yu and Mr. Cameron received their awards on October 16th, 2013 at UNB’s Faculty of Law Awards Night ceremony. 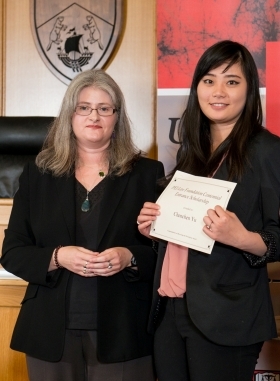 Photo: UNB Law Professor, Professor Leah Theriault, presents the LFPEI Centennial Entrance Scholarship to Chenchen Yu. 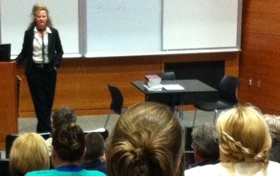 The 2013 Chief Justice Thane Campbell Lectureship in Law was delivered by Lesli Bisgould, BA (York University) 1987, LLB (Osgoode - York University) 1990. Ms. Bisgould delivered a session on the changes to and development of laws relating to animals and animal welfare in Canada. The Lectureship took place on the UPEI campus on October 4th. 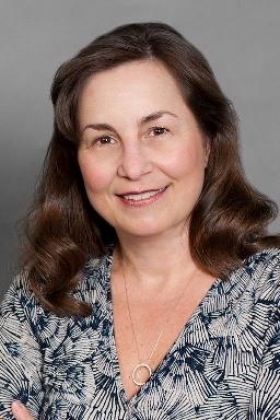 Ms. Bisgould has been practicing law since 1992, focusing on animal law and animal rights. She is also an adjunct professor at the University of Toronto's Faculty of Law where she teaches a course on animals and the law. She is also the author of a textbook entitled Animals and the Law (2011). Paul Kiley, Chair of the Law Foundation of PEI, congratulates the 2013 scholarship recipients from the Holland College Legal Administration Program. The recipients were Katie Carver (left in the photo), and Angela Jones (right).